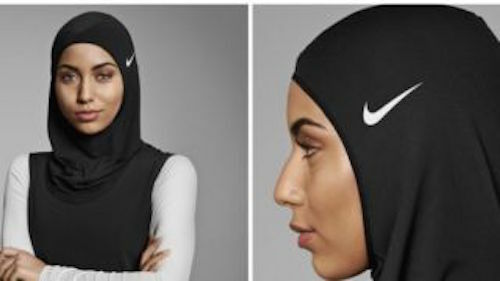 Nike Inc. will introduce a hijab for female Muslim athletes early next year, becoming the first major sports apparel maker to offer a traditional Islamic head scarf designed specifically for competition, the company said on Wednesday. The head covering, marketed under the “Pro Hijab” brand, is designed to allow athletes to observe the traditional Islamic practice of covering the head, without compromising performance. Made from a lightweight, flexible material, the hijab is expected to hit stores shelves in early 2018, Nike said in a statement. In recent years, the hijab has become the most visible symbol of Islamic culture in the US and Europe. Many Muslim women cover their heads in public with the hijab as a sign of modesty, but some critics see it as a sign of female oppression. With sensitivities over immigration and the perceived threat of Muslim extremism running high, the head scarf has led to attacks against Muslim women. At the same time, the hijab has evolved in a symbol of diversity that Nike has embraced. The Women’s March on Washington, held the day after President Donald Trump’s inauguration, used the face of a woman wearing a hijab in an American flag pattern as its promotional image. Muslim athletes visiting Nike’s headquarters in Beaverton, Oregon, just outside of Portland, have complained about the difficulties of wearing a hijab while competing, according to the company. The company consulted with Muslim women athletes from around the world, including Middle Eastern runners and cyclists, in the designing of the hijab.